Fast-food waitress Fawn Townsend of Raleigh, N.C., knows exactly what she is going to do if her salary goes up with Tuesday's increase in the federal minimum wage: start saving for a car so she can find a second job to make ends meet. "My goal personally is to get a vehicle so I can independently go back and forth to work and maybe pick up extra work so I can have that extra income, because minimum wage is not cutting it," said Townsend, who is 24 and single. "Being a single person, you can't pay all your bills with one minimum wage job." Many lawmakers, along with advocates for low-wage workers, are celebrating the first increase in the federal minimum wage in a decade. Yet many acknowledge that raising it from $5.15 an hour to $5.85 will provide only meager help for some of the lowest-paid workers. About 1.7 million people made $5.15 or less in 2006, according to the Labor Department's Bureau of Labor Statistics. "The reality for a minimum wage worker is that every penny makes a difference because low-wage workers make the choice between putting food on the table and paying for electricity or buying clothes for their children," said Beth Shulman, former vice president of the United Food and Commercial Workers Union. 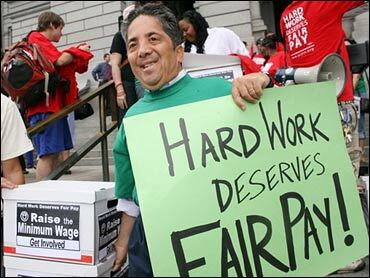 "Saying that, it's clear going up to $5.85 is not enough to really make sure that people really can afford the things that all families need," said Shulman, author of "The Betrayal of Work: How Low-Wage Jobs Fail 30 Million Americans." Minimum wage workers will get an additional 70-cent boost each summer for the next two years, ending in 2009 at $7.25 an hour. That comes to just above $15,000 yearly before taxes for a 52-week work year. Now, someone in such a job and earning $5.85 an hour would bring home $12,168 a year before taxes. The federal poverty level for singles is $10,210, couples is $13,690 and $17,170 for families of three. "In the wealthiest country in the history of the world, it is an outrage that anyone who works full time would still wind up in poverty," said Rep. George Miller, D-Calif., chairman of the House Education and Labor Committee. "Everyone who puts in an honest day's work should receive a fair day's pay." Poverty and the minimum wage are becoming a major issue in the Democratic presidential race. John Edwards and Barack Obama are emphasizing raising the minimum wage during their tours of impoverished areas. Edwards, who said he wants to eliminate poverty within a generation, favors raising the minimum wage to $9.50. Obama is advocating a "living wage" that would go up as inflation rises and he has promised to eliminate the phrase "working poor." More than two dozen states and the District of Columbia already have minimum wages higher than the federal one. Even in those states, an increase in the federal minimum wage probably will have a ripple effect, increasing the salaries of Townsend and others. North Carolina raised its minimum wage from $5.15 to $6.15 in January. "It's a long overdue first step," said Cindia Cameron, the national organizing director of 9-to-5, the National Association of Working Women. Minimum wage workers typically are young, single and female and are often black or Hispanic. Even then when the full increase is enacted, minimum wage workers will be just scraping by. "It's not enough money to meet your basic needs, I'm talking about your rent, your gas, and gas to get back and forth to work," said Sonya Murphy, head organizer of the Mississippi Association of Community Organizations for Reform Now, or ACORN. But at the same time, employers who pay many of these low-wage workers say increasing the minimum wage only means they have to raise the prices of the products, cut back on employees' hours or let some workers go. "When you go into the grocery story now, you may be checking your own groceries, you may be bagging your own groceries," said Jill Jenkins, chief economist for the Employment Policies Institute. "All of these things are because of mandated wage hikes. When you have to pay more, employers begin to find other options to keep costs down." At $7.25 an hour, the most likely response from restaurants will be "increases in menu prices, elimination of some positions and reduction of staff hours to try and offset some of the increased labor costs," said Brendan Flanagan, the association's vice president of federal relations. Others say the effect on the economy will be negligible. A PNC Economic Outlook survey done in April showed three out of four small- and middle-market business owners said raising the minimum wage would have little or no impact on their businesses. "In a tighter labor market, they already raised wages to be competitive," said Stuart Hoffman, chief economist for PNC Financial Services Group.